The Gospels are the linear compiliation of the books of Matthew, Mark, Luke and John. Gospels 1 covers the life of Christ from Birth up until His passion week. This course, Gospels 2, will cover the passion week, His crucifixion, and resurrection. 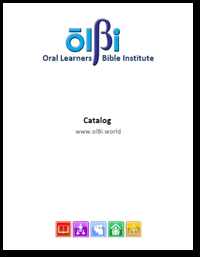 COMING SOON: Click on the links below to go to the resource pages for Bible 121 in Hindi, Gujarati, or Tamil. NOTE: This course was originally listed as Bi123. Copyright 2015 All Rights Reserved. Anyone wishing to use any content contained within this site should contact Robb Hawks at the Oral Learners Initiative. See the contact information below.